A revolutionary, precise and ultra reliable ultrasonic bulk water meter with no moving parts.With superior hydraulic and batteries that last up to 15 years, the Octave is today’s best choice in bulk meters for Utilities, Waterworks, Industrial and Agricultural applications. Compared with conventional valves coaxial (or coax valves) use significantly fewer components leading to robust, highly reliable designs. At the same time the simplified more linear flow path through a coaxial valve gives superior flow rates when compared to conventional solenoid valves. General purpose solenoid valves with connection sizes from M5 to 3" BSP (G). Also manifold mount and special configuration. ACL’s have expanded their range of high pressure solenoid valves for air or water comprise three models capable of controlling pressures of up to 150 bar. Wide range of plastic solenoid valves for use with water and steam, fitting styles include threaded, John Guest push-fit and hosetail. Threaded sizes from 1/8" to 3" BSP(G). Beta Valve has manufactured solenoid valves for the vending and drinks dispense industry for over twenty five years. Since 1991 we have produced our own range of dry-armature dispense solenoid valves for both hot and cold water applications. Our range of high quality water meters are produced by Arad. Every meter is individually tested and inspected to ensure quality and reliability. Many of Arad's water meters are MID certified for use in the European Union and a number have been tested and approved to WRAS standards. In sizes from 1/2" to 12" all of Arads' industrial water meters are available with an optional electrical output for connection to process control, data logging or BMS equipment. RPE's RPM series of compact modular water pressure regulators is designed to reliably and precisely stabilize the pressure on the outlet side of the regulator. 5 pressure versions available: 0.5 bar; 1.2 bar; 2 bar; 3 bar; 4 bar. Our general-purpose stainless steel solenoid valves from ACL srl are suitable for a wide range of media. We offer both 2 way and 3 way types with normally closed, normally open operation. Solenoid coils can be supplied with VDE or UL approvals on selected voltages. Ex m and Ex d coils are also available. 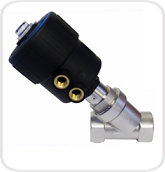 We offer stainless steel solenoid valves to suit virtually any application. These versatile water pipe fittings are part of the modular Universal Series. Used in pairs to provide a useful range of fitting adaptors that includes threaded BSP, John Guest push-fit and hosetail fittings. With more than 35 years of experience, CINTROPUR® has based its reputation on quality products in the water filtration business. The brand name CINTROPUR® covers a wide range of centrifugal filters for use with clean water, food products and drinking water. (fittings from ¾" to 3". Flow rates from 1 to 30 m3/h). CINTROPUR® filters are designed to remove all the solid particles suspended in the water (earth, sand, rust, etc.). The RF series of water flow sensors are available in four flow-rate models: 0.-3.6, 0.5-7, 1-15 and 5-30 litres/min. The new RFMA series offeres enhanced accuracy for more demanding applications. SMC produce both solenoid and air operated 2-port valves using in filter bag dusting applications, the VXF2 (solenoid type) and VXFA2 (air operated) valves are available with a range of orifice diameters from 20 to 100 mm . These angle seat valves from ACL are an unbeatable solution to control fluids and gases when high flow and low pressure drop are required. Stainless steel bodies and stainless or polymer actuator. Arad’s Dialog3G system is a complete wireless meter-reading solution especially suited to sites with multiple sub-meters, such as apartment buildings, mobile home parks, industrial estates and shopping centres, allowing site managers and water suppliers to automatically monitor remote water meters in real time. The Gladiator is Arad's proven highly accurate rotating piston type positive displacement water meter. Flowing water causes the piston to rotate within its chamber, each piston revolution being equivalent to a known volume of water. The piston movement is transferred by a magnetic coupling to the register. The concentric mounting version of the Gladiator UK is tailor made for the UK market.